I'm sure you have all seen this, but I had to post it just in case. Jimmy Fallon and Justin Timberlake made a "History of Rap" a while back, and recently came out with Part 2!! Don't act like you didn't get up and start dancing at 1:45. Jimmy Fallon is one of my favorite people and just wrote a book full of his "Thank you notes"
If you've never seen his show, (Noel loves his house band, The Roots, so we watch occasionally), here's a taste of how hilarious his Notes are. Love this post hon! Thanks for the Roots shout out. 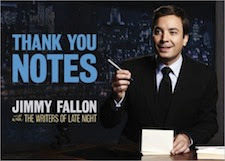 A friend of mine named Collin was watching that show and realized that his picture got used on Jimmy Fallon's Thank You segment and just figured out that his picture is also in that Thank You Notes book. LoL He's the well dressed kid or something... I thought it was hilarious.